Rainbow Bridge, Completed on 26 Aug 1993, this gateway to Odaiba is among the most beautiful modern bridges in Japan. It is decorated with 444 lights, which change according to the seasons. Odaiba is a large artificial island and a popular shopping and entertainment district in Tokyo Bay, across the Rainbow Bridge from central Tokyo. 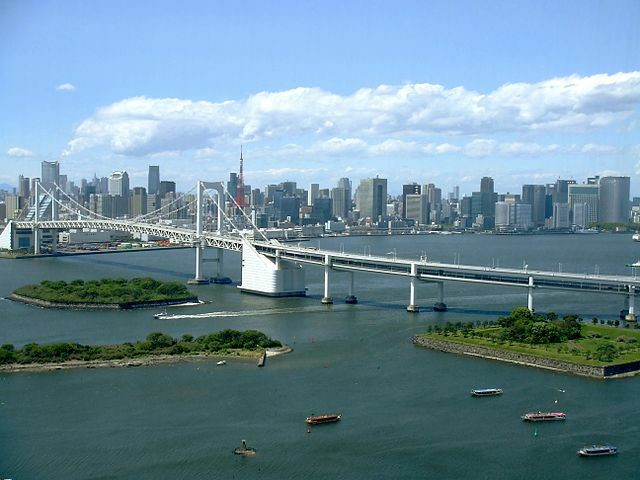 Odaiba is one of the proposed venue locations in Tokyo's bid for the 2020 Summer Olympics. The events to be held there under the venue plan include beach volleyball at Shiokaze Park, triathlon and marathon swimming at Odaiba Seaside Park, and gymnastics at a new gymnastics venue. 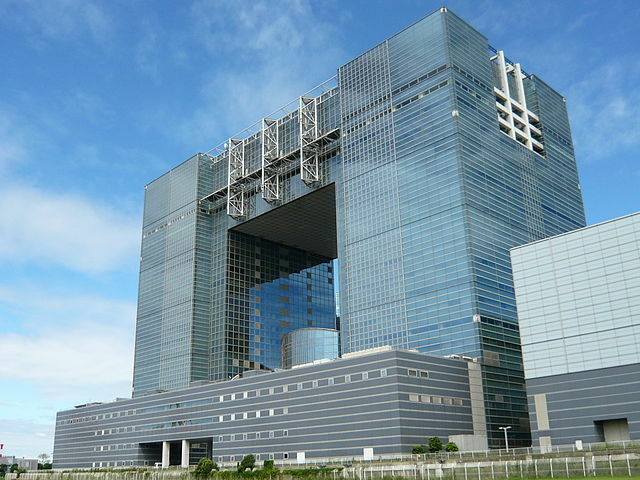 Fuji TV Building is an Odaiba landmark which looks like it's built of tinkertoys. The 25 floor metallic building features a huge silver ball which is 32 meters in diameter and weighs an estimated one thousand and two hundred tons. The ball serves as an observation deck with views across Tokyo Bay and the Odaiba area. The TV station gives you a chance to see their operations on the 5th floor. The visit is more pleasant if you are familiar with Fuji's programming. 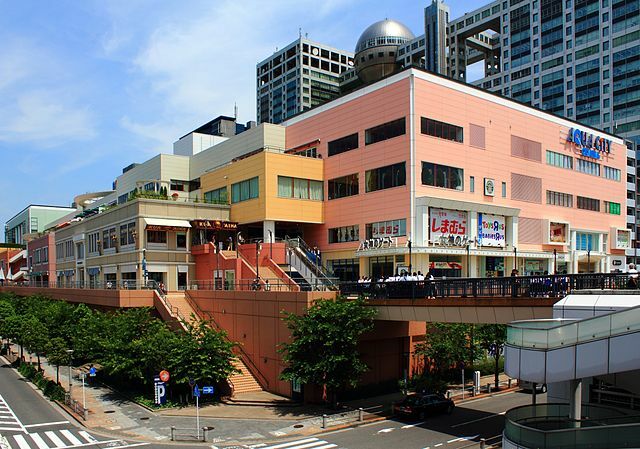 Decks Tokyo Beach is a six story shopping mall featuring boutiques, cafes and restaurants. The Decks has lots of entertainment for everyone. Some of the stores have a Tax free service in place. If you take your time you will find a restaurant from which you can watch the sunset and the bay. 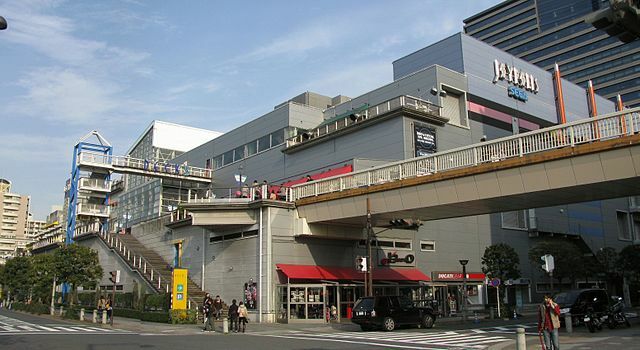 The center has one of the largest amusement arcades in Tokyo, the Sega Joypolis. Aqua City Odaiba is another monstrous shopping mall; there are floors of shops, boutiques and over 60 restaurants and cafes. The fifth floor houses a ramen food theme park where you can try different ramen from all over Japan. Aquacity also houses a 13 screen cinema complex. 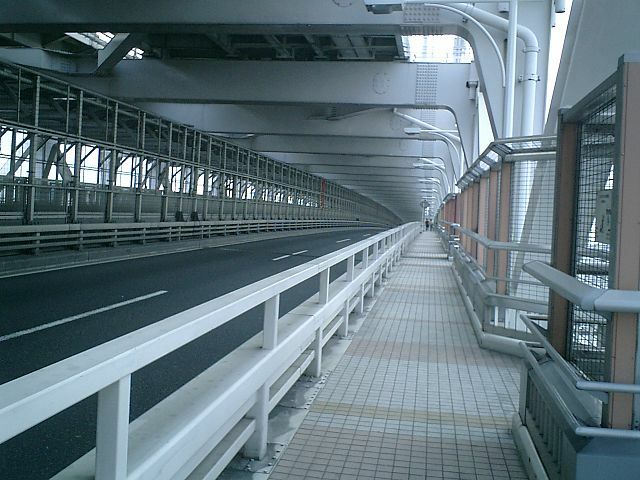 The upper floors offer nice views of the Tokyo Bay and Rainbow Bridge. Aquacity is situated next door to the Decks Tokyo Beach complex. 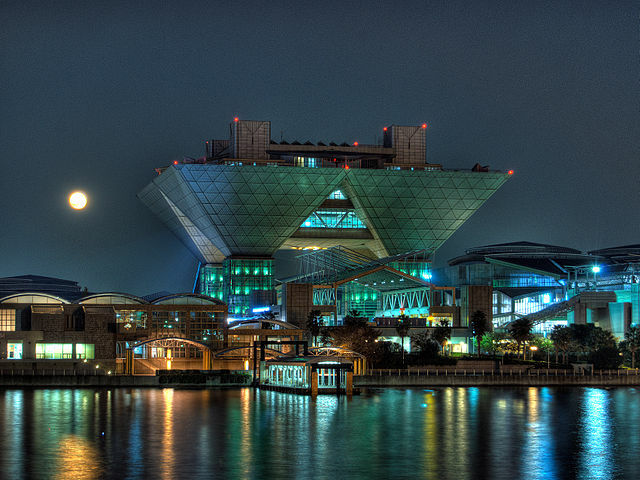 Diver City Tokyo is the newest shopping and entertainment facility on Odaiba. There is a wide range of dining establishments set amongst a food court named Tokyo Gourmet Stadium. 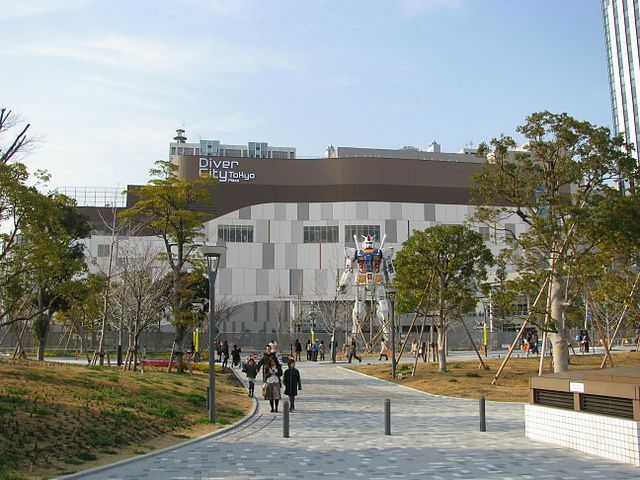 Its most unique attraction is an amusement facility known as Gundam Front Tokyo, which is based around the popular giant anime series’ robot Gundam. A "life sized" Gundam statue stands in front of the building. 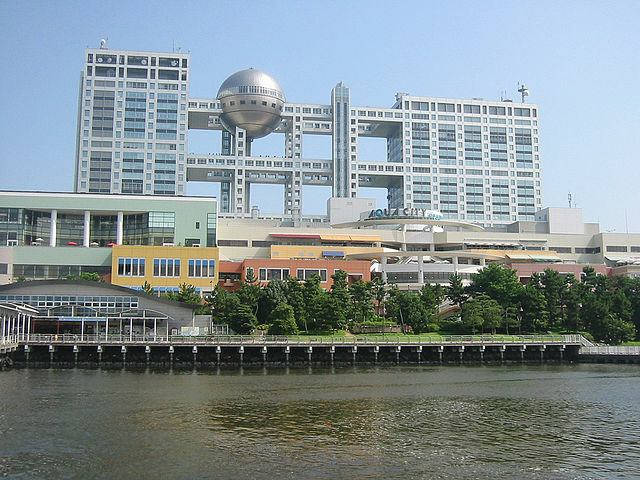 Diver City is located directly behind the Fuji TV building. Telecom Center is a 21 story building, a major hub on the information highway with several large satellite antennas on its observation deck. Best visited around sunset, the 99m-high observation deck allows views of the Rainbow Bridge, Skyscrapers of Shinjuku, and on a clear day as far as Mount Fuji. Tokyo Skytree and Tokyo Tower, all set to a backdrop of the glittering lights of Tokyo city. Museum of Maritime Science is a six-story museum shaped like a full-sized ocean liner, unsurprisingly devoted to ships. Exhibits include Japanese boats, items related to the navy, shipping industry, fishing, sailing, maritime recreation, and the environment of the seas and oceans around Japan. One of the main displays, a gigantic turbine engine, was actually set in place first and the museum was built around it. There are a few historic vessels on the adjacent wharf. You can board two real ships that are permanently docked next to the museum. 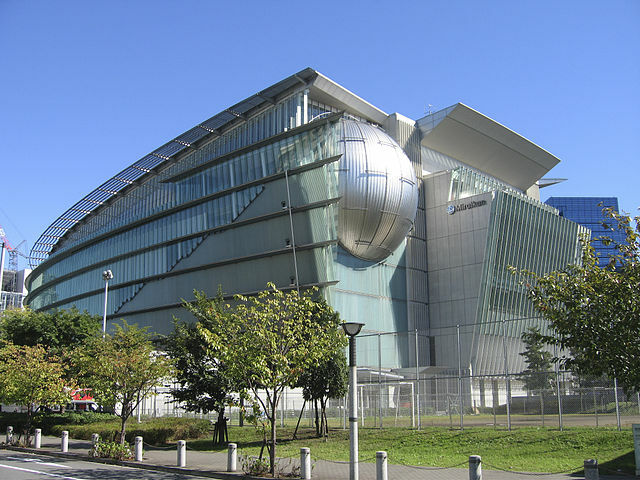 National Museum of Emerging Science & Innovation simply known as "Miraikan", is a museum created by Japan's Science and Technology Agency. As the name indicates new technologies like robots, information technology, biology and space modules are presented here as well as demonstrations and physical experiments for the inquiring mind are given. This highly interactive and bilingual science museum features many fascinating objects including, models of satellites and a full size model of a section of the International Space Station. 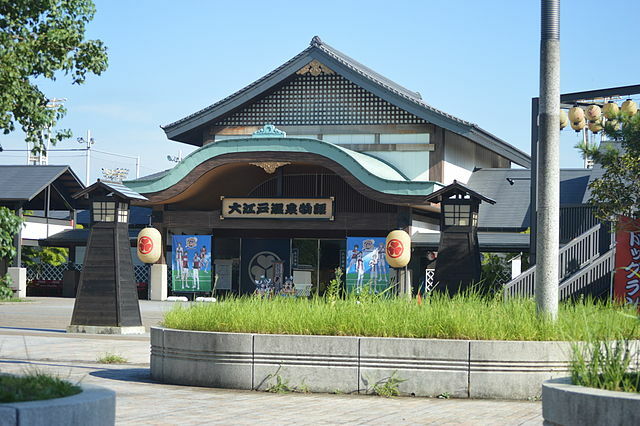 Oedo Onsen Monogatari is a hot spring theme park; a fully functioning spa, with great indoor and outdoor baths, sauna, massage, fun shows, shops, and many restaurants. Baths are fed by hot spring water pumped from a depth of 1400 meters. The experience feels more fun for families and groups. You are not totally naked in these Hot Springs; to start you place all the belongings in a locker, wash and shower then it is up to you what temperature spring you would to soak your worries away. 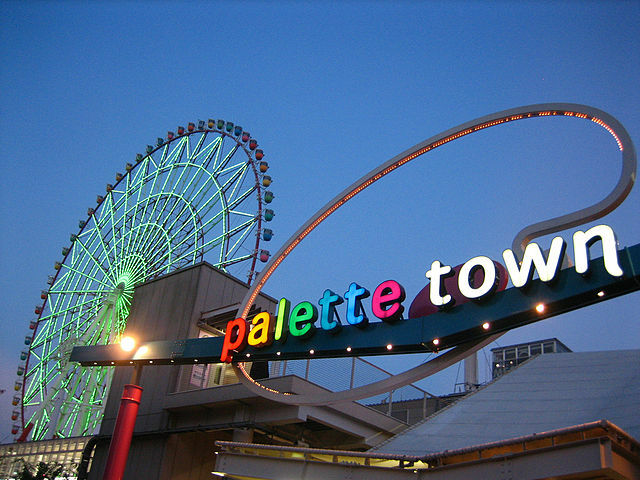 Palette Town is a large shopping and entertainment complex that includes the Zepp Tokyo music venue, Venus Fort, Toyota Mega Web, and Tokyo Leisure-land. Ferris Wheel "Daikanransha" is a 115 meters tall. Daikanransha is visible from the central urban area of Tokyo, and passengers can see the Tokyo Tower, the twin-deck Rainbow Bridge, and Haneda Airport, as well as central Tokyo, during their 16-minute ride. At night the wheel is brightly lit by 120,000 neon tubes programmed to display multiple patterns in over 100 colors. Venus Fort is part of the Palette Town complex and is one of the many attractions the area offers. 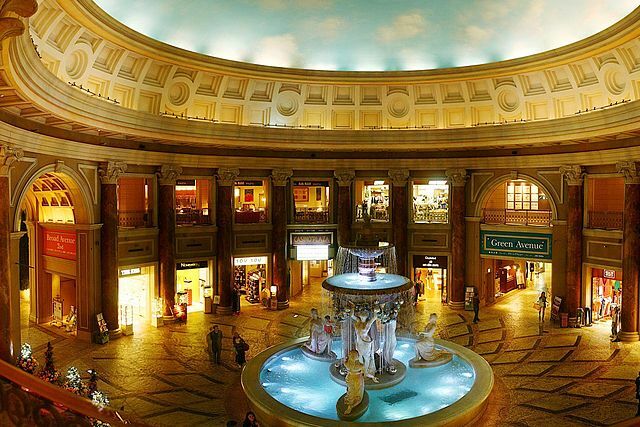 Some effort has been made at Venus Fort to avoid the cookie-cutter style of other Odaiba malls. The style of interior mimics 18 century Italian streetscapes with fountains, and ceilings that simulate the sky shifting from day to night. 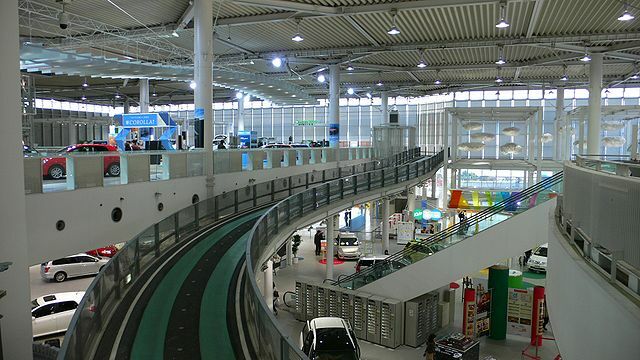 The mall contains over a hundred shops, fashion boutiques, cafes and restaurants, including a few outlets shops on the upper floor. Toyota Mega Web is a giant Toyota showroom comprised of 6 exhibits that shows off all of Toyota's latest models and technologies. If you're a car enthusiast and particularly like Japanese cars, then this place might be a must-visit. You will find a multitude of Toyota models, some of which are sold in Japan only and not seen elsewhere. 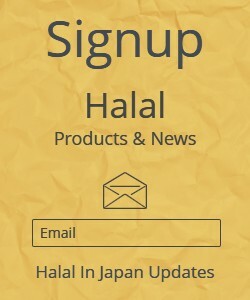 You can test drive some of the models "requires driving license valid for Japan". Tokyo Big Sight is the popular nickname for the Tokyo International Exhibition Center, a Japanese Convention Center that opened in April 1996. 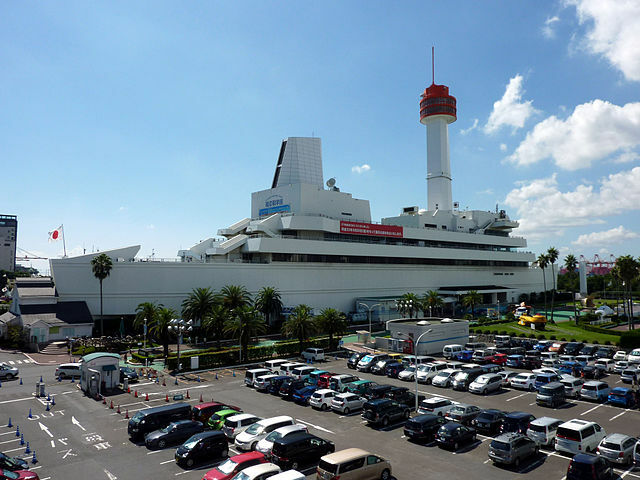 The center is Japan's largest convention venue. Its most iconic feature is the visually distinctive Conference Tower. Tokyo Big Sight is a planned venue for the 2020 Summer Olympics and will host Wrestling, Fencing and Taekwondo events, in addition to serving as the main broadcasting center and press center for the Games. The southern corner of Shiokaze Park, close to the ventilation tower of the highway, features a barbecue place highly popular during the warmer season. Barbecue equipment and tools as well as ingredients are available for rent. Reservation may be required during main seasons. 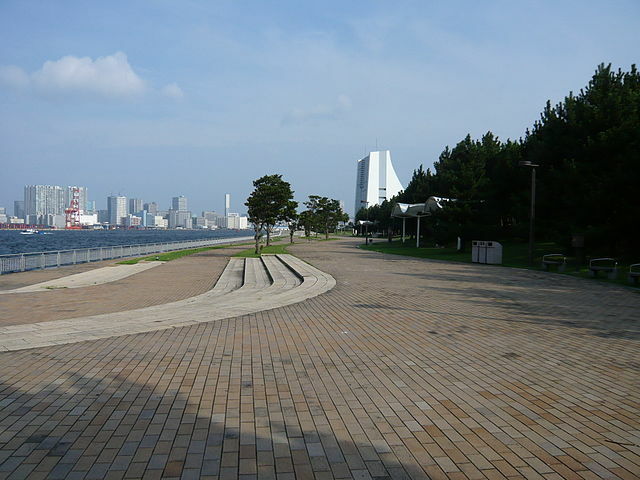 A walk along the sandy beach takes you to Odaiba Marine Park next to Daiba Park. The area features one of two beaches in mainland Tokyo, but swimming is forbidden and not recommended anyway as the water is rather polluted. 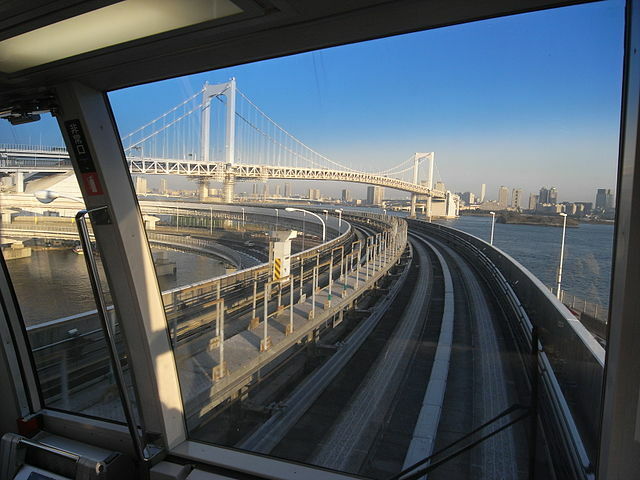 Train - An attraction in itself, the driverless elevated trains cross the Rainbow Bridge with a 270-degree loop for some great views of Tokyo bay. From Shimbashi Station – take Yurikamome Line to Daiba Station "15 minutes". Boat – Tokyo Water Bus operates between Hinode Pier and several stops in Odaiba. Direct boats are available from Asakusa to Odaiba less frequently. On Foot - You can in theory cross the Rainbow Bridge on foot for free, if inhaling exhaust for 40 minutes sounds like your idea of a fun time. Bicycles are not allowed on the bridge. The view over the Port of Tokyo is nice especially around sunset, though in winter "Nov to Mar", you have to enter by 17:30 and to exit by 18:00. In other months you can enter the pedestrian part of the road from 9:00-20:30 "30 minutes before you have to exit". Keep in mind that the Shibaura-side entrance can be hard to find, and that you have to choose which side to walk beforehand. The northern side is recommended if you wish to look at buildings in the city center from above the port.